Founded in 2013, stichting Bitcoin Nederland — The Bitcoin Foundation of The Netherlands promotes the digital currency revolution from its headquarters in Amsterdam, The Netherlands. One of its most visible projects is the monthly Bitcoin Wednesday conference series which as of April 2016 has produced 34 events about the digital currency revolution including more than 200 speakers for more than 1500 actual attendees, making it easily one of the most diverse in the country in terms of both programming and audience. The goals and activities of the foundation are determined by periodic polls that are open to the public. For the sake of transparency, the polling is taken during Bitcoin Wednesday, done quickly and simply with a show of hands. 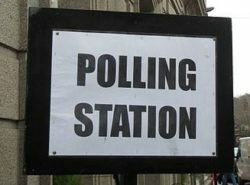 The results of the previous polls are published on this website here and here. During Bitcoin Wednesday on 4 May 2016, we’ll again have an informal discussion about the direction of The Bitcoin Foundation of The Netherlands, followed by an open poll. Participation in the discussion and the poll is free and open to all. Whether you’re interested in the digital currency sector, would like to have a say in our future activities or just curious to learn more, we encourage you to attend. Attendance is completely free when you RSVP here.